It is rare to find a family doctor so well able to give quality care in such a wide variety of situations and arenas. 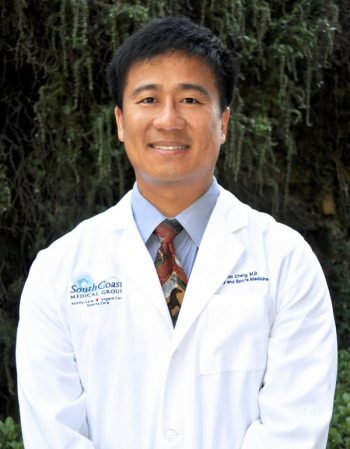 Dr. John Cheng is an integral member of South Coast Medical Group, serving residents of Aliso Viejo, California, and the surrounding communities, including Laguna Niguel, Laguna Hills, Laguna Beach, and Mission Viejo. He’s board-certified by the American Board of Family Medicine and Fellowship-trained in Sports Medicine. From where does a doctor gather and shape his “bedside manner”? Dr. John Cheng’s “kind manner” began its shaping in his childhood, while growing up in a small hospitable town in Texas. That shaping continued on through his residency and fellowship at the prestigious University of California at Los Angeles and Kaiser Programs in Family and Sports Medicine. Today, as he maintains his board certification and continues to research and utilize the latest technologies, his admired manner continues its shaping. As the son of a physician who practiced medicine the old-fashioned way, Dr. Cheng’s personal and caring approach to medicine was being shaped long before he studied at Texas Tech School of Medicine. Likewise, his lifelong love for the martial arts, that began in his childhood, was preparing him to become a family physician widely respected for his knowledge of nutrition and sports medicine. Dr. Cheng, a sports enthusiast, is an accomplished master martial arts instructor. In addition to serving in the past as team physician for several local high schools (Aliso Niguel, Laguna Beach and El Toro High Schools), he is sought out by both amateur and professional athletes alike. It is rare to find a family doctor so well able to give quality care in such a wide variety of situations and arenas. His commitment to care conventionally and holistically for his patient’s physical, emotional, and spiritual needs continues to delight his new patients and long-term patients alike. As a parent of two children, Dr. Cheng has a unique ability to empathize with a parent’s concern for a young child’s cough. His athletic endeavors and his prestigious sports medicine studies have prepared him extensively for numerous other situations. He often gives appropriate and valued advice to both the second-grade aspiring soccer star and the most serious of adult athletes. His reputable knowledge and understanding of nutrition serves both the individual growing in commitment to weight management, as well as the cancer survivor training for her first triathlon. When it comes to the care that Dr. Cheng consistently gives, it is not uncommon to see the same level of excitement and appreciation from a mother expecting her first child and a grandparent committed to staying healthy long enough to someday attend a great-grandchild’s wedding.